Rinse, dry and trim your asparagus. 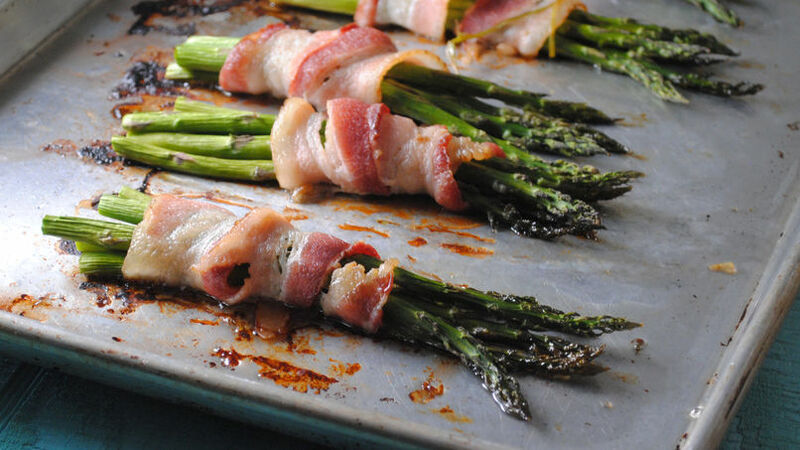 Divide the asparagus in small bundles and wrap each bundle with one slice of bacon. Place the wrapped asparagus on a baking sheet and sprinkle with black pepper. Bake for 10 minutes, flip and bake additional 10 minutes, until the bacon is crispy. Serve with a dipping sauce or over a crisp salad. Looking for an easy appetizer for your next special occasion? Why not try these tasty wrapped bundles! Bacon-wrapped asparagus are a wonderful appetizer for your next party. Simple to make, these bundles only take a few minutes to prepare and can be popped into the oven when guests arrive.